Once you’re signed up and billing is active you can create your first call. There are two types of calls you can create: Immediate and Scheduled. An immediate call starts straight away, a scheduled call starts at a date and time of your choosing. If you click on the Start Call button it will take you to the Create Call page where you can create your immediate call. If you need to create scheduled call then click on Schedule call button. 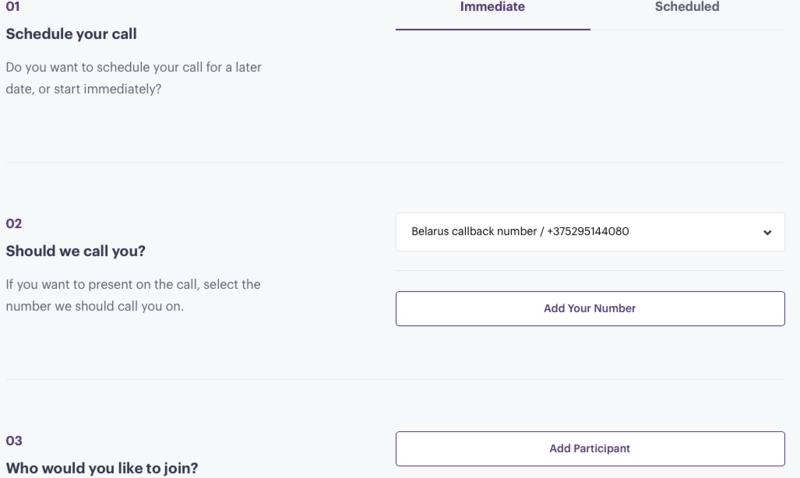 Here on the Create Call page you can add/select your callback number, add participant(s) and label. You can also set time/date and check button for sms notification if you need to create scheduled call. 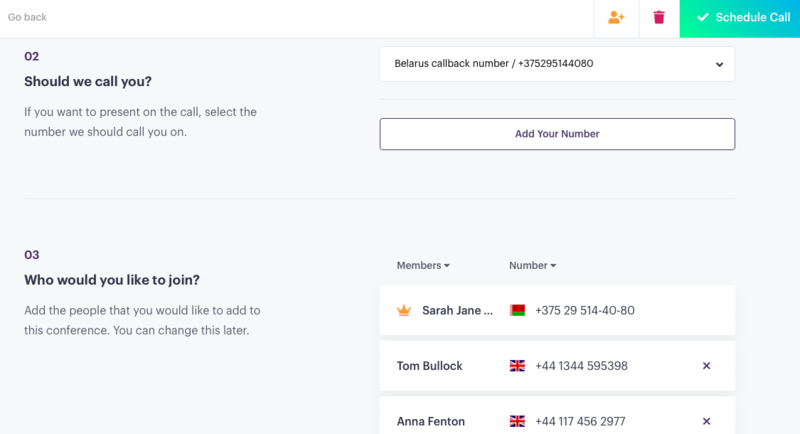 If you haven’t created any contacts in your address book yet, you can do so from the Create call page by clicking on the Add Participant button. In the Add Participant page you can click on the Create Contact icon which is located next to the Done button and then create a new contact. Once the contact has been created, it will be highlighted and you can add it to your call by clicking on the Done button. 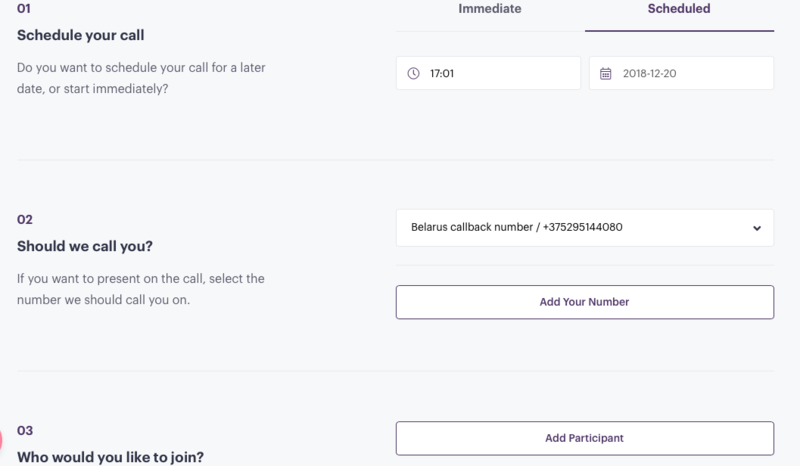 Now you are ready to create your call, just click on the Start Call or Schedule Call buttons. 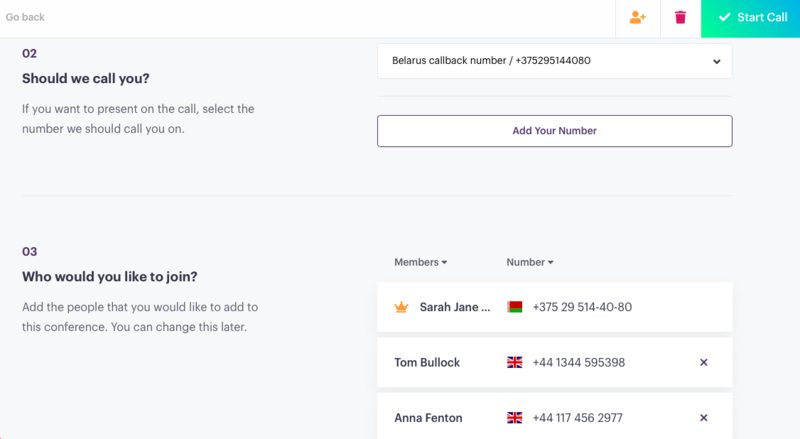 Your active calls will display under Dashboard - Active Calls until they are terminated, after which the call will display in your Call History. 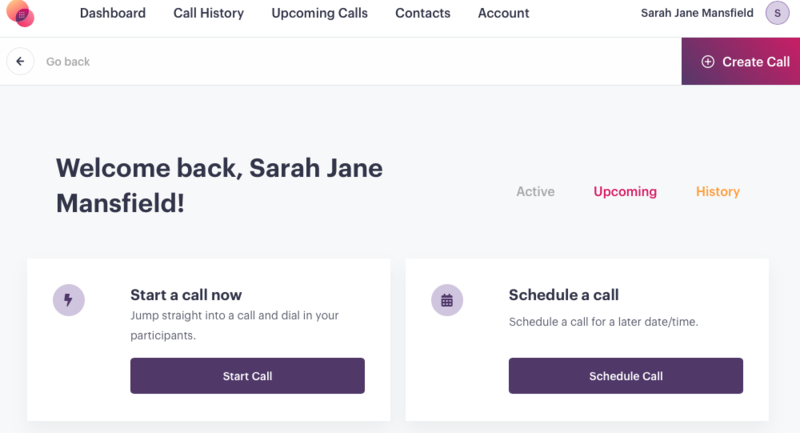 If you have created any future calls the Upcoming Call will display in the Dashboard under Upcoming Call or the Upcoming Calls pages. Participants of these calls will receive a notification via email if one is associated with their contact. If you have checked the SMS button then all participants will get sms reminder.